And while Guilds of Ravnica is an excellent way to get an introduction to five guilds, it's only part of the story of Ravnica. We've visited the plane twice before, meeting many more of its pivotal leaders and experiencing more than one way the guild is represented in games. When Blake introduced the Guilds of Ravnica Guild Kits—guild-themed decks covering a wide swath of new and reprinted cards for each of the five guilds—it was clear what they were meant to do: provide an easy way to get more of what makes each guild amazing in Magic. Each Guild Kit deck is different but acts as the perfect vehicle to go deeper into the guild you love most. Let's start with a quick look at the Izzet Guild Kit. The Izzet League is all about spells, and that's been true through each visit to Ravnica. In the original run, Guildpact, we met the replicate mechanic, which lets you get as many copies of a spell as you can pay for. With the follow-up adventure, Return to Ravnica, we got overload, which turns a spell that targets one thing into a spell that hits everything. Guttersnipe, a Return to Ravnica alumni that's back in Core Set 2019, is exactly the kind of card an Izzet deck needs! Gelectrode is an oldie but goodie that dishes out the damage turn after turn in a deck filled with spells. Hypersonic Dragon attacks just fine on its own, but giving sorceries the instant-speed option makes Mizzium Mortars and Stitch in Time much more powerful. 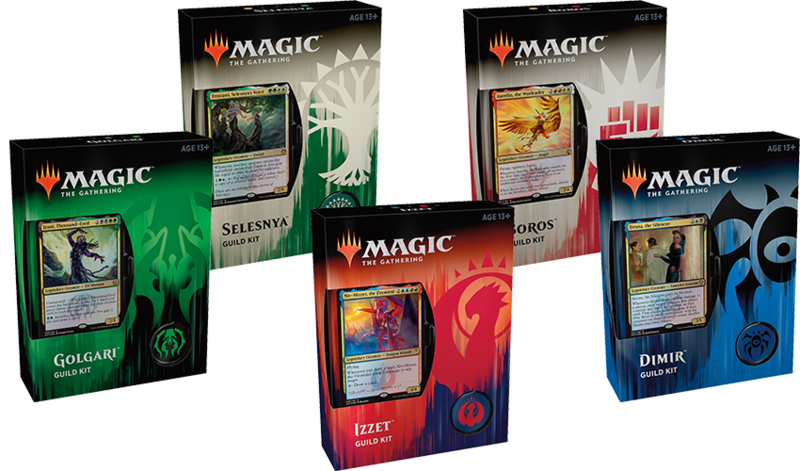 If you liked playing around with spells as Izzet in Guilds of Ravnica, the Izzet Guild Kit is exactly what you need to amp up the Izzet experience. And that's not counting all the extra legendary creatures and powerful spells you get to use. Among friends looking to double-down on what Guilds of Ravnica brings, adding a Guild Kit to up the ante of the guild experience is perfect for extending the battles. Okay, so maybe just adding "new" guild cards of your favorite guild isn't enough. Maybe you need to go bigger. Bolder. Beyond the constraints that one guild offers. If you've dreamed about two guilds joining forces, the Guild Kits are excellent to mix and match strengths. Individually, the Boros and Selesnya Guild Kits are fine representations of their guilds. The Boros Legion brings powerful but smaller creatures, like Sunhome Stalwart and Boros Swiftblade. The Selesnya Conclave rocks with Watchwolf and Dryad Militant. That's scratching the surface of both guilds! Both Boros and Selesnya "go wide" by playing more creatures and spells that make token creatures, like Scatter the Seeds and Sworn Companions. Both guilds also pack combat tricks to protect and attack with creatures, like Boros Charm, Master Warcraft, and Bounty of Might. In terms of gameplay—attacking with several creatures—both guilds are in alignment. Drawing down from the best of both sides gives you the perfect opportunity to try martialing twice the guild power at once. Glare of Subdual and Master Warcraft can crack open any defense, giving you a late-game push to close things out. Glare of Subdual can also shut down an opponent's offense if you're not ready to attack yourself. Privileged Position gives opponents headaches trying to deal with your best creatures. Firemane Avenger and Daring Skyjek—the battalion representatives from Boros in Gatecrash—combine well with the token-making power of Selesnya Guildmage (a Ravnica: City of Guilds veteran) to ensure you always have enough creatures to go around. Most of the cards are white, including some of the powerful guild cards thanks to hybrid mana, which makes it easier on the mana. Mixing and matching how guilds can go together is a perfect way to put a Guild Kit or two to work. If it wasn't obvious from the inclusion of legendary creatures in every deck, the Guild Kits are an excellent way to expand your favorite guild's Commander options. Consider the Dimir Guild Kit. Circu, Dimir Lobotomist is, at first blush, the weakest commander given its restriction of exiling one or two cards from one player's library at a time. But being overlooked, or landing a Jace, the Mind Sculptor and a little luck, can lock away powerful cards multiple decks can play. Plus, when you exile a card it's (almost) never coming back as opposed to putting it into a graveyard. Etrata, the Silencer is in Guilds of Ravnica and is a self-explanatory combination: hit someone three times to knock them out. There are plenty of Etrata combo decklists floating around to reference, too. Lazav, Dimir Mastermind is the opposite of Etrata—your best plan is to sit back and let others duke it out. With Lazav hanging out, you can wait for better and better creatures to die (or get put into the graveyard from a library) before putting your guild leader to work. Mirko Vosk, Mind Drinker is all-in on "milling" cards from opponents' decks into their graveyards. An excellent lieutenant for Lazav, Mirko Vosk is fantastic if you want to go deep on the early take of Dimir and leverage what opponents are forced to throw away. Szadek, Lord of Secrets is a totally unique twist on milling opponents. Without a little extra work from something like Surestrike Trident, you'll never actually deal damage to an opponent with Szadek, but the replacement effect creating a 20/20 flying Vampire with just two attacks is a spectacle (and milling power) to behold. Each of these legendary Dimir creatures plays in the blue-black space but asks you to create very different decks. What would help Circu and Szadek might overlap some, but the standout cards and exciting additions you'd find for each will be different. The Dimir Guild Kit is just the start of what's possible for crafting a new Dimir Commander deck, as it's also packed with a range of cards that can support different commanders. Jarad, Golgari Lich Lord loves to both see a well-stocked graveyard of creatures and show you how to put more there in style. It's an excellent combination with common cards like Rhizome Lurcher! Izoni, Thousand-Eyed is an excellent source of creature tokens and card-drawing power late in a game, with strong decklists floating around already. Savra, Queen of the Golgari is usually paired with a commander like Prossh, Skyraider of Kher or Izoni above, but she can more than stand on her own alongside simple sacrifice outlets like Ravenous Harpy, Ruthless Knave, Thallid Soothsayer, and Vraska, Golgari Queen. Sisters of Stone Death asks for the most mana of any Golgari commander option, but if you can power her up completely, you'll unlock the ability to steal the most powerful creatures opponents use. Remember, you can use its ability before any damage is dealt so first strike, deathtouch, and many other combat effects won't affect the Sisters. The strength of Golgari in Commander—being able to use the graveyard as a resource consistently, as well as converting things like creatures or permanents into other cards and value—makes it a force to be reckoned with and ensures you can tweak or test different ways to make the most of the guild. Every guild can do incredible things in Commander, which makes each Guild Kit a stepping stone deeper into the format. If you adore a guild in Guilds of Ravnica, it's hard to go wrong exploring them more through their Guild Kits. Whether it's just powering up what you already enjoy, mixing in your second-favorite guild, or making a leap into the world of Commander, each deck arms you with amazing cards that are all on theme for you!